Non-small-cell lung carcinoma (NSCLC) accounts for approximately 75%–85% of the lung cancers and it is a highly heterogeneous disease. Despite recent advances in diagnosis and various therapeutic strategies in the past two decades, no real improvement in the survival has been achieved. Tumor stage is the most significant prognostic parameter for lung cancer and it is the basis for deciding treatment option. Even in early-stage disease, recurrence rate is very high. In addition, prognosis was found to vary significantly in patients with the same stage. Hence, predictive markers have a crucial role in selecting adjuvant therapy for reducing chances of recurrence and improving the survival rate. There are several reports of oncogenes and tumor suppressor genes as potential prognostic markers that can predict survival in patients with NSCLC. Due to heterogeneity and complexity of lung cancer, multiple markers may be more helpful than using a single marker. Cytologic samples such as fine needle aspiration, bronchoscopic brushings and washings, and bronchoalveolar lavages are increasingly being used for the diagnosis and subclassification of lung cancer, but sputum samples are rarely used for it. Recently, we have reported sputum homogenization methods by which the whole-cell content of the sputum can be effectively used for morphological evaluation and for molecular analysis including immunocytochemistry. The p53, a tumor-suppressor gene involved in controlling G1 checkpoint and cell cycle regulation, has antiproliferative and antitransforming activity. In addition, p53 protein has many other physiological functions that induce cell arrest in G1 phase and apoptosis in response to a variety of genotoxic damage or cell stress. The p16 gene product of CDKN2A/p16INK4a binds CDK4 and inhibits the formation of CDK4/cyclin D complexes, resulting in the inhibition of the cell-cycle-dependent phosphorylation of the Rb protein. The loss of cell cycle regulatory function of p53 has a synergistic effect with the altered p16 protein status. Galectin-3 belongs to a family of 15 carbohydrate-binding proteins widely distributed in normal and neoplastic cells. It is a multifunctional protein found both intracellularly and extracellularly and has a major role in regulation of cell growth, cell adhesion, cell proliferation, angiogenesis, and apoptosis. Intracellular galectin-3 inhibits apoptosis induced by chemotherapeutic agents such as cisplatin and etoposide thereby initiating cancer progression and drug resistance. Hence, galectin-3 has been reported as a promising marker for tumor progression and survival. Epidermal growth factor receptor (EGFR; HER-1/ErbB1) is a receptor tyrosine kinase (TK) of the ErbB family. Upon ligand binding and receptor homo or hetero-dimerization and activation (phosphorylation), EGFR signals downstream to the PI3K/AKT and RAS/RAF/MAPK pathways. These intracellular signaling pathways regulate cell proliferation and apoptosis. In tumor cells, TK activity of EGFR may be deregulated by various oncogenic mechanisms, including EGFRgene mutation, increased gene copy number, and protein overexpression. Improper activation of EGFR TK results in increased malignant cell survival, proliferation, invasion, and metastasis. EGFR overexpression is observed in tumors of more than 60% of patients with metastatic NSCLC. In this study, immunocytochemistry of these four proteins, namely, p53, p16, EGFR, and galectin-3 has been performed on sputum samples and compared with that of tissue samples to see whether the expression patterns are similar in tissue samples and sputum. In addition, the significance of these proteins in predicting prognosis of lung cancer was analyzed. The putative role of these proteins in cell cycle regulation, apoptosis, and cell proliferation as well as the repeated report of these markers in tissue samples formed the rationale for selecting these markers. Immunocytochemistry with the above panel of markers on sputum samples has not been reported so far. The study subjects were selected from a cohort of 3185 patients referred from the Sanatorium for Chest Disease and Medical College Hospital, with a history of chronic obstructive pulmonary disease and/radiologic findings suspicious of malignancy. From this, 90 patients were selected based on adequacy of sputum samples, availability of corresponding tissue samples, and clinical follow-up data. This includes 25 adenocarcinoma (ADC), 33 squamous cell carcinoma (SCC), 23 non small cell carcinoma (NSCLC), and 9 small-cell lung carcinoma (SCLC). Among them, 5 cases were in stage I, 16 cases in stage II, 29 cases in stage IIIA, 15 cases in stage IIIB, and 25 cases in stage IV. Patients undergoing treatment for cancer prior to recruitment and patients with other chronic diseases such as tuberculosis were excluded from the study group. The subjects selected for the study underwent treatment according to the standard protocol. The study was approved by the Institutional Review Board and Human Ethics Committee, and informed consent was obtained from each subject. Sputum samples and bronchoscopic biopsy samples were also collected. The pathologic stage was determined according to the TNM staging system of the American Joint Committee on Cancer. Data on recurrence, cause, and time of death were obtained from the hospital records. Sputum samples were collected for 5 consecutive days, homogenized, and processed using “Cytorich red solution” (Cytorich Red Preservative; Tripath Imaging Inc., Burlington NC, USA). The samples were vortexed with twice the volume of red solution and kept for 30 min. The mixed sample was then transferred to a 50-mL centrifuge tube and again vortexed and centrifuged at 600g for 5 min. The pellet was resuspended in buffer solution and again vortexed and centrifuged at 800g for 10 min. The cell pellet was again vortexed and monolayer smear was prepared using the settling chamber assembly provided by BD Surepath, USA. on precoated slides and the remaining samples were used for cellblock preparation. Immunocytochemistry was performed in 5 μm sections obtained from cell blocks of sputum and corresponding tissue samples according to standard ABC technique using DAB as chromogen. Sections were incubated overnight with primary antibody, and Novalink polymer was used as secondary system and counter-stained with hematoxylin. Antigen retrieval was done for tissue section in sodium citrate buffer (pH 6.0) at 700 W for 15 min. Immunocytochemistry was also performed on monolayer smears whenever adequate sample was available, for which cell permeability was enhanced by treating with sodium deoxy cholate. Primary antibodies were procured from Santha Cruz Laboratories, USA. (EGFR, p53, p16-mouse monoclonal; dilution 1:100) and Novacastra, UK. (galectin-3, mouse monoclonal antibody; dilution 1:50). Human breast carcinoma tissue was used as positive controls for p16, p53, and EGFR. Prostrate tissue was used as positive control for galectin-3. Immunoscoring was done by two of the investigators independently, and a repeat scoring was performed if 100% agreement was not obtained for sputum samples and corresponding tissue samples. The percentage of positive tumor cells was determined by counting a minimum of 200 well-defined malignant cells. H-scores were then calculated as the product of intensity (0–3) and distribution (0%–100%) with H-score ranging from 0 to 300. H-score 20 and above was taken as positive. 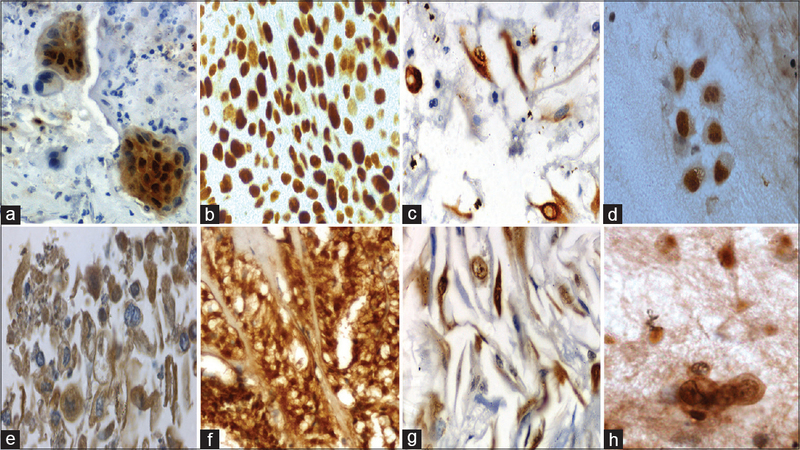 For p53 and p16, nuclear staining was considered as positive expression. But nuclear and cytoplasmic staining was considered as specific for galectin-3. For EGFR, cytoplasmic and membrane positivity were considered as specific criteria. Western blot analysis was performed for all the markers to assess the sensitivity of the antibodies. The statistical significance of expressions of different markers with respect to clinicopathological parameters was assessed using Chi-square test/Fisher's exact test (for small samples). Overall survival (OS) was the main endpoint of this study. OS was calculated from the date of diagnosis to the date of either death or last follow-up. Survival curves were obtained using Kaplan–Meier method and were compared by log-rank test. All statistical tests were two-sided and P < 0.05 was considered to be statistically significant. Analysis was performed with SPSS software version 11.0. Prognostic factors were assessed using Cox proportional hazards regression model. The subjects selected for the study included both genders with a mean age of 60 years. The histological type of five stage I tumors with poor prognosis include ADC (1), SCC (1), NSCLC (2), and small cell carcinoma (1). p16 positivity was observed as diffuse, dense, or focal expression in the nuclei, even though mild expression was noticed in the cytoplasm of tumor cells in some cases. Sputum samples of ADC and SCC showed dense p16 positivity in the nucleus and mild positivity in the cytoplasm [Figure 1]a and [Figure 1]b. In tissue samples of ADC also, the expression was mainly nuclear but mild cytoplasmic expression was noticed in few samples. In tissue samples of SCC, dense nuclear expression was seen. Mutated p53 expression was observed as dense staining in the nucleus of tumor cells in cell blocks, smears, and in tissue sections [Figure 1]c and [Figure 1]d. Correlation of p16 expression with various clinicopathological features showed significant association with histologic type of tumor (P = 0.002) only. Galectin-3 had diffuse or focal expression either in cytoplasm/nucleus or in both [Figure 1]e and [Figure 1]f. Galectin-3 nuclear expression had significant difference with expressions of p53 (P = 0.01) and p16 (P = 0.04). EGFR positivity was observed as diffuse, dense, or focal staining in the cytoplasm or membrane [Figure 1]g and [Figure 1]h. Monolayerd smears had faint and diffuse expression compared wih cell block and tissue samples. In that case, the expression patterns of cell blocks were considered for analysis. EGFR-positive expression was found to have significant association with metastasis (P = 0.028) and histologic type of tumor (P = 0.000). Even though sputum cell blocks and the corresponding tissue samples had positive expression for all the marker proteins, intensity and pattern of expression showed slight variation between monolayered smears and cell blocks with respect to tissue samples. 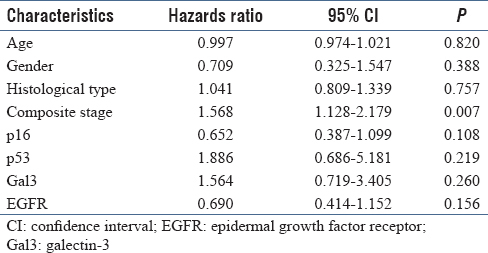 On univariate analysis of marker expression with various clinicopathological features, only composite stage was found to be a significant factor for prognosis (hazards ratio: 1.568, 95% confidence interval: 1.128–2.179, P = 0.007) [Table 1]. One-year survival probability for p16 negative and positive cases was 35.0%, and 42.0%, respectively, whereas 2 years survival probability for p16 negative and positive cases was 5.0% and 11.6%, respectively. Survival probability of p53-positive tumors was 38.6% for 1 year and 9% for 2 years. Patients with galectin-3 cytoplasmic positivity were found to have 1-year survival probability of 39.4%, whereas those with galectin-3 cytoplasmic negativity showed 1-year survival probability for 50%. Among the cases with galectin-3 nuclear positivity, 2-year survival probability was seen in 9.5% of cases. In EGFR-positive tumors, 2 year's survival was observed in 13.3% of cases. But OS for all the four markers revealed no significant association. One-year survival probability of p16-positive tumors was 60.0% for stage I, 47.6% for stage II, 50.3% for stage III, and 25% for stage IV (P = 0.01) [Figure 2]a patients. Among p16-negative cases, 2-year OS was noticed only for stage III (7.7%) tumors. In p53-positive cases, 2-year survival was noticed only for stage II (37%) and stage III (5.3%) cases (P = 0.01) [Figure 2]b. In p53-negative cases, 2-year survival was seen in stage III cases (20%). In galectin-3 cytoplasm-positive cases, only stage II and stage III cases had 2-year survival probability of 38.1% and 5.2%, respectively (P = 0.03) [Figure 2]c. In galectin-3 cytoplasm-negative tumors, 2-year survival was noticed in 50% for stage I and 25% for stage II cases (P = 0.02) [Figure 2]d. Among galectin-3 nucleus-positive patients, 2-year survival was observed only in stage II and stage III cases, that is, 43.3% and 5.4%, respectively (P = 0.01) [Figure 2]e. In galectin-3 nucleus-negative cases, 2-year survival was noticed in 33.3% stage II cases and 16.7% stage III cases. For EGFR-positive tumors, 2-year survival probability was 51.3% in stage II and 8.4% in stage III (P = 0.003) [Figure 2]f. OS analysis by stage for EGFR-negative tumors showed 1-year survival probability of 57.1% for stage II and 10% for stage III cases. Western blot analysis of proteins from tumor tissue showed dense bands for p16, p53, galectin-3, and EGFR proteins, whereas normal tissue had no bands. Earlier studies have reported aberrant expression of p16 in 27%-54% of NSCLC, but its role in prognosis prediction was still conflicting. This study has observed that patients with negative p16 expression survived for a shorter period than those with positive p16 expression, but it was not statistically significant. This finding was in concordance with previous reports. Moreover, p16-positive tumors in stages I–III had significantly enhanced survival probability than of stage IV. Nakagawa et al. also had a similar observation. A few contradictory reports are also available regarding early stage of the disease and poor prognosis in p16-positive tumors. The p53 protein has an important role in regulating cell cycle progression. Due to very short half-life, it cannot be detected in the normal lung tissue. Mutated p53 gene has greater stability and can be detected by immunohistochemical methods. Even though the role of p53 mutations in lung carcinogenesis is obvious, the prognostic importance is not proved. The poor survival outcome of patients with p53 mutation had been reported earlier also. Even though several studies have estimated the interactive effects of p53 with other biomarkers and also with clinicopathological features, no concordance could be achieved. In this study, the OS of p53-positive cases was comparatively lower compared with negative tumors. 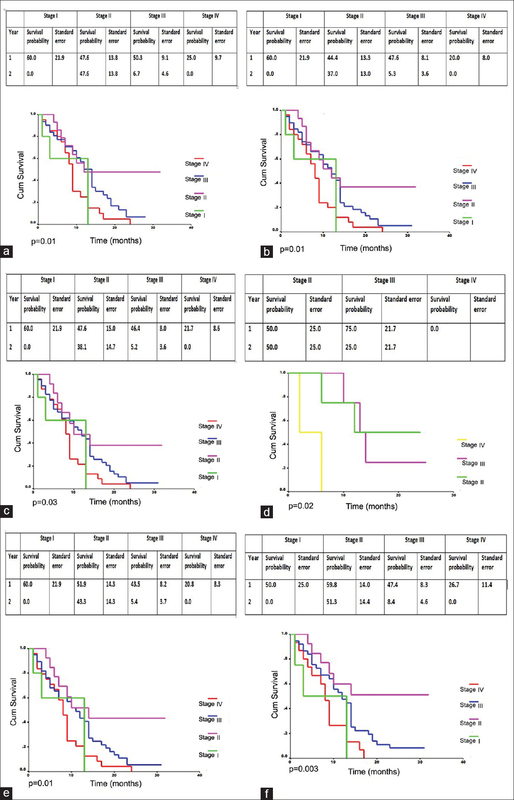 Analysis of stage-wise survival probability in tumors with mutated p53 showed that stage III tumors have worst survival benefit than stage I and II tumors. Other reports also confirm that high level of p53-positive expression in tumor cells has a negative impact on survival. The survival probability of galectin-3 cytoplasmic negative tumors was higher than that of positive tumors. In the case of galectin-3 nucleus-positive cases also, survival was low when compared with negative cases. But stage-wise survival analysis did not reveal any uniform pattern, which may be due to the small sample size or heterogeneity of the tumor. Nuclear and cytoplasmic coexpression noticed in this study may be due to the presence of two variants of galectin-3, that is, phosphorylated and nonphosphorylated forms and phosphorylation is required for its nuclear export. Previous studies observed that proliferating cells had higher expression of galectin-3 in the nucleus than in cytoplasm, but quiescent cells predominantly expressed galectin-3 in the cytoplasm in mouse 3T3 fibroblasts. EGFR expression did not reveal any significant association with clinicopathologcal features except for histologic type of tumor and metastasis. In earlier studies, features such as age, gender, and tumor stage have shown significant association with EGFR expression. Sequist et al. observed significant correlation between smoking status and EGFR positivity. This study did not observe any significant association between EGFR positivity and smoking status. However, among the 69 EGFR-positive samples included in this study, 65.2% were smokers. Another observation in this study is the significant association of EGFR positivity with metastasis that is in concordance with previous observations, that is, patients with mutated EGFR were found to have more chances of lung, brain, and bone metastasis. It was also noticed that EGFR-positive tumors had longer period of survival than negative tumors especially in early stages. The above findings suggest that EGFR mutation is a favorable prognostic factor regardless of treatment. This observation was in concordance with that of other investigators, where EGFR-mutation-positive patients showed a prolonged survival regardless of treatment modality. Izar et al. reported that patients with completely resected stage I EGFR mutation-positive NSCLC had a significant survival advantage compared with EGFR wild-type patients and mutation of the EGFR gene is a positive prognostic marker in completely resected stage I NSCLC. The expression pattern of all the four proteins in tissue and cell block/monolayer preparations showed no significant difference on survival analysis. This indicates that sputum samples, either monolayer or cellblock preparations, can be used as an adjunct or alternative to tissue samples in survival analysis. Immunocytochemistry of p16, p53, galectin-3, and EGFR in sputum samples can be tried as a predictor of prognosis and survival. Positive expression of p16 and EGFR proteins had a significant survival benefit, and alteration of these two proteins can be considered as a positive prognostic marker in NSCLC. Moreover, patients with positive EGFR expression had an association with metastasis, which suggests its possibility as a predictor of occult metastasis. On the other hand, positive galectin-3 expression and p53 expression had a poor prognosis compared with negative tumors. Even though the pattern of expressions of different markers shows heterogeneity, data revealed that these markers can be attempted as predictors of prognosis and survival. However, further prospective studies with more number of samples are suggested for the validation of these marker proteins. The authors acknowledge the Department of Biotechnology, Govt. of India, for funding this project. Junker K. Prognostic factors in stage I/II non-small cell lung cancer. Lung Cancer 2001;33 Suppl 1:S17-24. Mountain CF. Revisions in the international system for staging lung cancer. Chest 1997;111:1710-7. Nikliński J, Niklińska W, Laudanski J, Chyczewska E, Chyczewski L. Prognostic molecular markers in non-small cell lung cancer. Lung Cancer 2001;34 Suppl 2:S53-8. Schneider PM, Praeuer HW, Stoeltzing O, Boehm J, Manning J, Metzger R, et al. Multiple molecular marker testing (p53, C-ki-ras, c-erbB-2) improves estimation of prognosis in potentially curative resected non-small cell lung cancer. Br J Cancer 2000;83:473-9. Saraswathy Veena V, Sara George P, Jayasree K, Sujathan K. Comparative analysis of cell morphology in sputum samples homogenized with dithiothreitol, N-acetyl-L cysteine, cytorich(®) red preservative and in cellblock preparations to enhance the sensitivity of sputum cytology for the diagnosis of lung cancer. Diagn Cytopathol 2015;43:551-8. Polyak K, Waldman T, He TC, Kinzler KW, Vogelstein B. Genetic determinants of p53-induced apoptosis and growth arrest. Genes Dev 1996;10:1945-52. Hatakeyama M, Weinberg RA. The role of RB in cell cycle control. Prog Cell Cycle Res 1995;1:9-19. Gazzeri S, Gouyer V, Vour'ch C, Brambilla C, Brambilla E. Mechanisms of p16INK4A inactivation in non small-cell lung cancers. Oncogene 1998;16:497-504. Rumilla KM, Erickson LA, Erickson AK, Lloyd RV. Galectin-4 expression in carcinoid tumors. Endocr Pathol 2006;17:243-9. Takenaka Y, Fukumori T, Raz A. Galectin-3 and metastasis. Glycoconj J 2002;19:543-9. Fukumori T, Kanayama HO, Raz A. The role of galectin-3 in cancer drug resistance. Drug Resist Updat 2007;10:101-8. Ladanyi M, Pao W. Lung adenocarcinoma: Guiding EGFR-targeted therapy and beyond. Mod Pathol 2008;21 Suppl 2:S16-22. Ciardiello F, Tortora G. EGFR antagonists in cancer treatment. N Engl J Med 2008;358:1160-74. Nair A, Klusmann MJ, Jogeesvaran KH, Grubnic S, Green SJ, Vlahos I, et al. Revisions to the TNM staging of non-small cell lung cancer: Rationale, clinicoradiologic implications, and persistent limitations. Radiographics 2011;31:215-38. Veena VS, Preethi SG, Jayasree K, Sujathan K. Cytological analysis of sputum: The simplest and preliminary method of lung cancer diagnosis – A retrospective analysis of 8690 samples of symptomatic patients. Int J Sci Res Publ 2012;2:1-6. Groeger AM, Caputi M, Esposito V, De Luca A, Bagella L, Pacilio C, et al. Independent prognostic role of p16 expression in lung cancer. J Thorac Cardiovasc Surg 1999;118:529-35. Kratzke RA, Greatens TM, Rubins JB, Maddaus MA, Niewoehner DE, Niehans GA, et al. Rb and p16INK4a expression in resected non-small cell lung tumors. Cancer Res 1996;56:3415-20. Nakagawa K, Conrad NK, Williams JP, Johnson BE, Kelley MJ. Mechanism of inactivation of CDKN2 and MTS2 in non-small cell lung cancer and association with advanced stage. Oncogene 1995;11:1843-51. Sakaguchi M, Fujii Y, Hirabayashi H, Yoon HE, Komoto Y, Oue T, et al. Inversely correlated expression of p16 and rb protein in non-small cell lung cancers: An immunohistochemical study. Int J Cancer 1996;65:442-5. Huncharek M, Kupelnick B, Geschwind JF, Caubet JF. Prognostic significance of p53 mutations in non-small cell lung cancer: A meta-analysis of 829 cases from eight published studies. Cancer Lett 2000;153:219-26. Geradts J, Fong KM, Zimmerman PV, Maynard R, Minna JD. Correlation of abnormal RB, p16ink4a, and p53 expression with 3p loss of heterozygosity, other genetic abnormalities, and clinical features in 103 primary non-small cell lung cancers. Clin Cancer Res 1999;5:791-800. Cheng YL, Lee SC, Harn HJ, Chen CJ, Chang YC, Chen JC, et al. Prognostic prediction of the immunohistochemical expression of p53 and p16 in resected non-small cell lung cancer. Eur J Cardiothorac Surg 2003;23:221-8. Hubert M, Wang SY, Wang JL, Sève AP, Hubert J. Intranuclear distribution of galectin-3 in mouse 3T3 fibroblasts: Comparative analyses by immunofluorescence and immunoelectron microscopy. Exp Cell Res 1995;220:397-406. Mathieu A, Saal I, Vuckovic A, Ransy V, Vereerstraten P, Kaltner H, et al. Nuclear galectin-3 expression is an independent predictive factor of recurrence for adenocarcinoma and squamous cell carcinoma of the lung. Mod Pathol 2005;18:1264-71. Pham D, Kris MG, Riely GJ, Sarkaria IS, McDonough T, Chuai S, et al. Use of cigarette-smoking history to estimate the likelihood of mutations in epidermal growth factor receptor gene exons 19 and 21 in lung adenocarcinomas. J Clin Oncol 2006;24:1700-4. Sequist LV, Joshi VA, Jänne PA, Muzikansky A, Fidias P, Meyerson M, et al. Response to treatment and survival of patients with non-small cell lung cancer undergoing somatic EGFR mutation testing. Oncologist 2007;12:90-8. Fujimoto D, Ueda H, Shimizu R, Kato R, Otoshi T, Kawamura T, et al. Features and prognostic impact of distant metastasis in patients with stage IV lung adenocarcinoma harboring EGFR mutations: Importance of bone metastasis. Clin Exp Metastasis 2014;31:543-51. Shepherd FA, Tsao MS. Unraveling the mystery of prognostic and predictive factors in epidermal growth factor receptor therapy. J Clin Oncol 2006;24:1219-20. Izar B, Sequist L, Lee M, Muzikansky A, Heist R, Iafrate J, et al. The impact of EGFR mutation status on outcomes in patients with resected stage I non-small cell lung cancers. Ann Thorac Surg 2013;96:962-8.